The Real Estate Agent Headhunter® wants to help you win at the biggest transaction of your life. For most people, when it comes to buying or selling a home, there is no bigger transaction in life. Hundreds of thousands of dollars or (depending on the property) even millions of dollars could be at stake. Whatever the amount is for you makes this transaction a big deal. That’s why you should not take lightly the choice of your Real Estate Agent—you can lose lots of money with the wrong person! It’s amazing how quickly some people hire an Agent without doing any research on their background. Many folks will hire someone because they saw an ad and called the number or somebody they know (not in real estate) told them so-and-so is good. Few people bother asking the right questions to identify a good Agent. Many people don’t know what to look for in a Real Estate Agent to begin with, so when they do hire someone, they can go through the entire process and never realize they didn’t get great service! Alina Davidov saw this happen to good people too many times during her 18 year real estate career, which is why she started The Real Estate Headhunter®. With Alina, you are getting a seasoned real estate pro who will help you select a local Agent you can trust—someone who will deliver the customer service you deserve along with the best deal available that puts money in your pocket. The Real Estate Agent Headhunter® provides you access to a network of top performing Agents from communities all over America. These Agents understand the privilege they have working in this network. Alina is saving them money on advertising costs and they are receiving quality leads with no upfront fees required. The Agents in this network are motivated to prove themselves to Alina, and they know that Alina is monitoring them and basing future referrals on their performance. So this is a win-win for the Agent and YOU. Personally service the client 90% or more of the time, not hand off to team newer team members. Live by these basic rules: Call when they say they will, do what they say they will, show up when they say they will. #2 You get a rebate reward of up to $10,000 towards your closing costs. If your closing costs are less than the rebate reward, a check for the difference is cut to you at the closing table. Buy or Sell a home for $250,000 and save $ 500.00 in closing costs. Buy or Sell a home for $500,000 and save $1,000.00 in closing costs. Buy or Sell a home for $900,000 and save $1,800.00 in closing costs. The Real Estate Agent Headhunter® guarantees the delivery of your rebate reward to your closing table which will greatly reduce your closing costs. If your rebate is more than your closing costs, a check will be cut for the difference. While the Real Estate Agent Headhunter® will introduce you to top Agents from the best network of realtors® in the United States, you are not obligated to work with any Agent we refer and if you are not happy with your Agent at any time, Alina will step in and personally replace that agent (prior to contracting) with the right match from your local area. There is no cost to you during this entire process. Let’s now address a few frequently asked questions. Does the Rebate Deal Mean I Won’t Get Good Service? We have already covered many reasons why you can expect to receive great service from our Agents. Keep this in mind: our Agents are already top notch performers in their local areas and are not going to jeopardize their reputation over a deal with a rebate. Am I Obligated at Any Time? No. You are not obligated to pick any of the agents introduced to you and you are not obligated to close a transaction. You are free to change your mind. That depends. This service is NOT for everyone. The Real Estate Agent Headhunter is for “picky” people. In other words, this service is for people who want to find a top notch Agent in their area who has been “checked out” by a professional in the industry. This service is great for those who understand the difference a good Agent makes to their bottom line. Proposals from hand picked agents in your area who want to work on your project for you to choose from. Alina can help you compare the proposals and help weed out candidate agents who may not be the best choice for your specific needs. She gets past scripting and asks very specific questions to help you land the best Agent for the job. A generous rebate reward that saves you money at closing for working with The Real Estate Agent Headhunter®. 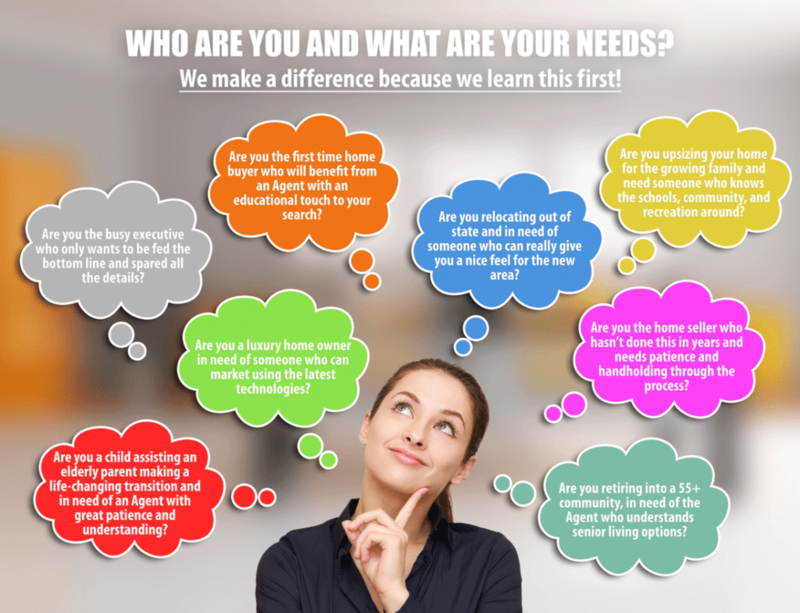 Are you ready to find the perfect Real Estate Agent? Contact Alina right now! She will be happy to talk about your needs and answer your questions.